"Redemption" - Part Two: "In Good Faith"
Superman fights Redemption, blasting him high into the air and then smashing him down in Australia, trying to figure out his powers and coerce him into standing down. Meanwhile, the pastor back in the church in Valley Falls channels his power into Redemption, empowering him to fight Superman with the power granted to him by the faith of his congregation. 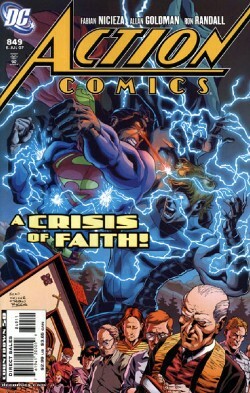 Redemption's powers fluctuate, and Superman goes to check on one of Redemption's congregation. When he returns, Redemption has fled. Clark contacts Oracle, and while he waits for her to secure information, he visits with the old woman who thought Superman was an angel, who assures him that faith is about how you believe in a given God, not which. Superman visits his parents, and discusses church, and why he hasn't gone to church since he was fourteen (earlier showing the burden of hearing people being deceptive as a small child). Clark Kent confronts the reverend, who previously used his power in the second World War to disastrous result. Redemption confronts him soon thereafter, with Superman's help, and the reverend stands down. At home, Clark enjoys one of Mahjoub's pretzels and ruminates on his own faith with Lois, relieved that everything worked out. Story - 5: I'm at a bit of an impasse with regards to extraneous dialogue and thought in media. For instance, here, sometimes dialogue that has no bearing on the plot and conflict, or only minor relevance, stays. Essentially, this entire two-issue story could have been accomplished in one issue. Then again, it's very beautifully written. Then again again, it confronts issues that by all rights, no Superman issue needs to, for reasons I'll explain. Then again again again, it's a good story. Then again to the power of four, it's also another one-off, villain-comes-to-town story, when we haven't seen a major villain since Up Up and Away and the beginnings of the Zod story that it's been so long since I've read a chapter of, I've forgotten the name without looking it up. The simple fact that there's a lot to knuckle into here speaks to the story in a good way. And a bad way. But enough hemming and hawing, I'll get to it. Superman says something very poignant in this issue: "No. I have no problem with the religion. I have a problem with abusing one's power in the name of anything." To me, this is a very strong sentiment that I can agree with fully. Which is why the writers of Superman should not have covered religion in this particular way in this issue. No, I don't mean don't bring religion into comics, though we all know Superman's seen enough Jesus comparisons in the last three years to found a religion. And no, I don't mean don't make a character whose power is based in religion. It can often be poignant, like Preus or even Redemption. I mean elaborating on Superman's religion. Let me emphasize this point I've brought up many times and draw it to a clearer, finer point. I AGREE WITH EVERY SINGLE SENTIMENT SUPERMAN UTTERS IN THIS COMIC, speaking from a religious perspective. Like Superman, I eschewed church at the age of 14 in the hopes of putting my faith in humanity, and I am guided by a general pragmatism to my moral code, despite the potential auspices of my Ma and potential consternation of my friends and family. In other words, if the goal is to make me relate to Superman more by making him a religious analogy I can accept, then they have succeeded. With everyone else, they have failed. And though it might seem ludicrous that I wouldn't want Superman to be like me, or espouse my beliefs, I DO NOT, vehemently. Superman should be a hero for EVERYONE. Taking personal issues like religion, and politics, and sexuality, and making Superman approach these subjects, while compelling from an academic standpoint, does not aid the character. Not even if I agree with his beliefs. Not even if I personally espouse them. Because then, how hypocritical would I be when I complain when Superman becomes a die-hard Christian? Either, to me, are irreconcilable with a character that is there for everyone. As Superman states, "No. I have no problem with the religion. I have a problem with abusing one's power in the name of anything." A very poignant notice. I then ask, to wit, why do the people with the power to control Superman and his aspirations ABUSE that power by putting a particular moral viewpoint on Superman, even if I agree with it? Now people who attend church regularly are estranged, people who believe a congregation the route to salvation, suddenly they have to assume, what, Superman doesn't do the same thing I do? Am I wrong? Is he wrong? Superman should never make you have to ask these questions. He's simply a hero for everyone. Period. One might argue that this makes the character one-dimensional. These are the same people that argue he's too powerful, or that he needs to be edgier in order to captivate attention. In other words, morons. Part of the challenge of writing is assuming the difficulties of form, and realizing that you can't put yourself into a work where it's not necessary, no matter how poignant, PARTICULARLY regarding concepts of religion, politics, and mythological characters. Zeus, in other words, can't suddenly question hurling lightning bolts just because you have an aversion to it, and so too can Superman not suddenly take a strong moral stance about religion and not come across as elitist, even if it's my brand of elitism. I re-emphasize, I agree with Superman's stance, but I don't want to take him, because that undermines Superman for others. Suggesting that missionaries who go into foreign lands to convert people, when they are murdered, are causing their own problems. Sure, that may be true, but WHY THE HELL bring something like that up, knowing what controversies it brings. Neal, Neal, Neal, I tell myself. You're undermining what you've cried for for YEARS, a deeper underlying context and characterization. TRUE, but these things don't require going into religion or politics. Note, for proof, the deeper subtexts and contexts offered by Superman and Mxy breaking the fourth wall and discussing childbearing and living in hope. Did they need to discuss the bris or lack thereof? Was it still a great story? Are men who abuse religion in order to achieve a political, war-like end to be stopped and condemned? Yeah. Is that subtext going to lead to Superman being accused of being a liberal, a conservative, and other misnomials? Yes. Is this an interesting topic? Yes. It's done to death, but it still works, and works well. Where this story confronts these issues in an open-ended fashion, it's great. Religious pawns. Overbearing people who use people's faith against them. The resurgence of the naive woman who adds perspective to Supes. ALL GREAT. Beautifully written, and I loved it. The larger issues here overpower my disgust at having co-opted Superman's religion or lack thereof for a story point, largely. But it's still there, and this story shouldn't be a five in that respects, because it undermines the character for others, even if I enjoy it. I'm truly conflicted in that respect. There are a few plot holes and annoyances. People talk a lot. Most of this story is not direct action, it's simple extrapolation, which is something (as people complain to Brian Michael Bendis, and I agree) better suited to prose than to a medium that is largely visual. Making people talk for page upon page can be quite compelling, but it's generally not as compelling as when it's interspersed with action. I find that comics are being VERY lenient toward an expositional storyline of late, and it doesn't please me. Ultimately, I believe this should have been one issue. They just did it AGAIN in Countdown 50. Four straight worthless pages of Flash Rogues talking, with one piece of plot information conveyed, a meeting. So too here, we have, what, five beats? Clark fights. Saves the missionaries (not shown, so not really a beat). Visits old lady. Visits home. Calls Oracle. Visits Reverend. Confronts Reverend as Supes. Talks to Lois. Okay. So eight. But eight beats over 22 pages? The panels are also CRAMMED with dialogue and extrapolation, making it an incredibly slow, dense, read, even if it's done well. So not only are the beats small and the deconstruction big, it's a LOT of extrapolation spread quite wide. Also, redeemed or not, these missionaries caused a LARGE number of deaths. Redemption, ironically, is never redeemed, and Superman claims to agree in a pragmatic, society-inspired viewpoint, but he doesn't take these people to answer for their crimes. In fact, he effectively sanctions the missionary work he condemns by allowing the church responsible to stand without scrutiny, even given his power of the press. You see the issues there? "I have a problem with abusing one's power in the name of anything." Subsume yourself into the story without abandoning depth, and this'll go from questionable but good to epic. I mean, don't get me wrong, in my personal life I tend to take a LOT of plugs about the appropriateness and inappropriateness of certain religious action, particularly with regards to missionaries, hurting people in the name of belief, and hypocritical actions. It's one of the banes of my existence. I enjoy seeing that trounced. I just don't like seeing Superman take a side in any religious or political ideology, and it's unfair to the readership. Art - 5: Very consistent with the post-IC style, a style I happen to dig. Particularly cool in the opening, with the landing in the Outback. The character design for Redemption leaves a lot to be desired, he's a ready-made-Mort in that respect, but the action is handled well, as is the confrontation scene in the end, where I could fairly feel the crackle in the room. Quite good. Cover Art - 4: A bit cluttered with effects, and I don't like the cheap gimmick of the CRISIS lettering when this had nothing to do with the Infinite Crisis. And hey, words on the cover. But the image is dynamic, it represents what really happened in the issue, and it's a strong piece.